PARA VISUALIZAR LAS BASES EN ESPAÑOL, DA CLICK EN LAS TRES LINEAS JUNTO AL LOGO DE HEROX. POSTERIORMENTE DONDE DICE: ENGLISH, DA CLICK A ESPAÑOL (BETA). What will higher education look like in 2049? How will it include all people, regardless of its background? How will it cater to the different ways in which each individual learns? What will be the role of educators? How will it integrate the technological advances in the field (such as 3D printers, virtual reality, augmented reality, biometrics, gamification, personalized learning algorithms, neuroscience)? How will the growing demand for education be met? How will students and teachers interact? How will they access the classroom resources? How will students be evaluated? Will there be any changes in higher education certificates? How will the curriculum change? If we put our mind to it, higher education in the future will be radically different. The first step is to imagine it. If you are creative, a pioneering and a visionary, and you have dreamed of a better and improve education, we need you. Tell us how you envision the higher education in 2049. We’ll reward the best SCI-FI short film, graphic novel or short story that inspires a new generation to transform higher education, an education that promotes the comprehensive development of all human beings. Click "Follow the Challenge" above to be notified of any status updates to the challenge. Click "Yes Sign Me Up!" above to register for the challenge. 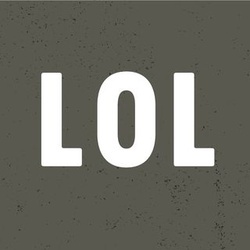 You will be notified of any status updates and be able to create an entry to the challenge. Click on the "Share" button or social media icons above to share this challenge with your friends, your family, or anyone you know who has a passion for discovery. Leave a comment in our Comments Thread to join the conversation, ask questions or connect with other innovators. 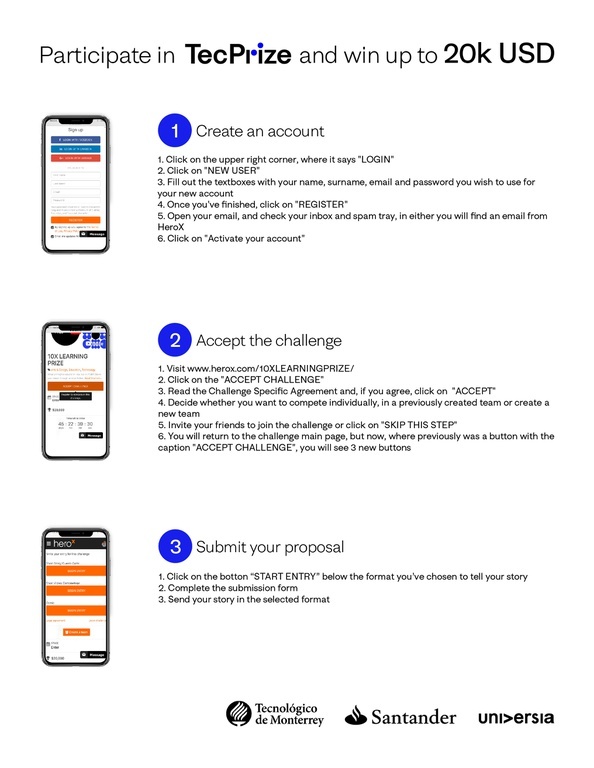 When you are ready to submit your entry, click on "Accept Challenge". For a tutorial, click on this link. Imagine being able to help solve educational problems that the majority consider impossible. Imagine working with the brightest minds in the world, backed by the most innovative universities. Imagine being part of a community of innovators, where your voice and opinions count, which celebrates creativity and ambition. All this is possible with TecPrize. 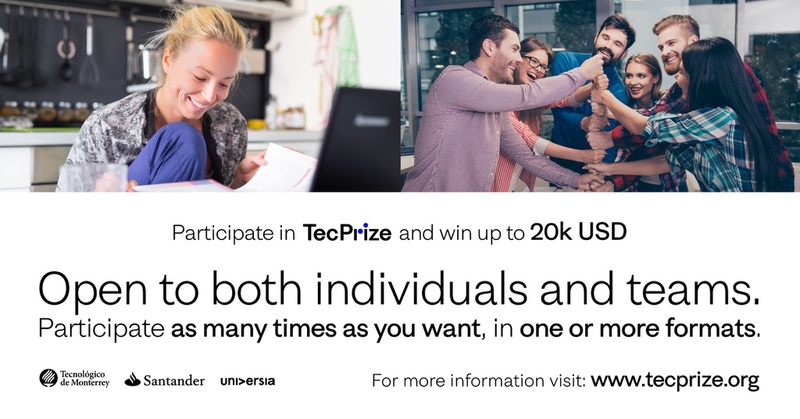 TecPrize, an open innovation platform which seeks to improve Higher Education through disruption, all the while forming leaders and advancing knowledge worldwide. TecPrize is an iniciative of Santander Bank and TecLabs, an educational innovation disruptive unit of Tecnológico de Monterrey. Tecnológico de Monterrey is a university founded in 1943, whose vision is to educate leaders with an entrepreneurial spirit, human sensibility and who are internationally competitive. It has 31 campuses in Mexico, 25 offices worldwide and 16 international liaison offices around the world. It offers 54 professional majors, 57 master's degree programs and specialties, 10 doctorate programs, and 3 baccalaureate programs, with which it serves more than 85,700 students. The institution is accredited by the Southern Association of Colleges and Schools (SACS) and it is ranked number 206 in the world's top 900 universities ranking, according to the QS World University Ranking (2016-2017). In the employability ranking, Tec de Monterrey is ranked first in Mexico and 56th worldwide. In the QS University Rankings: Latin America (2016), it is ranked number 7 and it is the only university in Latin America included the Top Schools for Entrepreneurship Ranking (2016) of the Princeton Review, occupying the 17th position. La Casa de los Orishás.